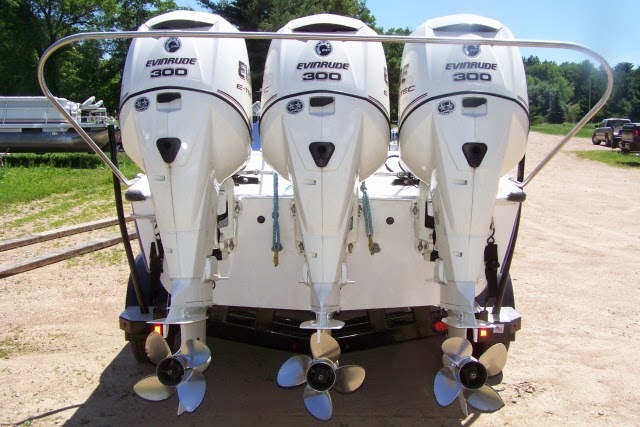 I have logged a lot of hours in outboard powered Hydrodyne and Dyna-Ski Boats since the mid 1970's. Most of the time pulling water skiers doing all sorts of things including kites and parasails. Pulling a lot of skiers or a flying skier/person requires thinking ahead. I take for granted that people know that they can fine tune a boat. Most any boat can be fine tuned to some degree. To what extent you want to go is only limited by time and dollars you are willing to spend. One of the easiest ways to fine tune a boat is using weight. I like using vinyl coated weights that are used for weight lifting. The weights can be purchased fairly cheap and some folks have them lying around the house already. Lots of ski clubs use 50 - 70 lbs sand bags and I have seen lead shot used and even V-8 engine cylinder heads. If you use weights just make sure they cannot shift easily. Placing them on the floor under seats is a good place to put them. Ski teams put them under the closed bow boats around and in front of the gas tank to help balance the boats multiple engines. Ski teams also use people in the boat often times while pulling bigger acts to help keep the high side of the boat down when making turns. The longer new style Dyna-Ski boats don't seem to need this as much as the older shorter Hydrodyne style boats. The nice thing about using people is the additional weight is not always in the boat and it can be moved around somewhat. In an open bow Dyna-Ski I like to add some weight to the nose of the boat under the front bow seat. 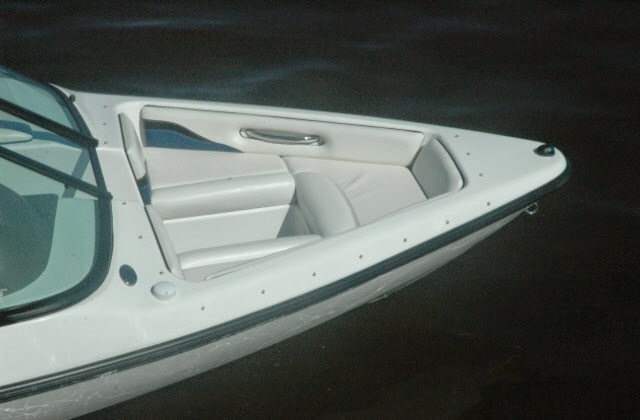 In a closed bow it can be placed in the front of the boat also. It is harder to do in the closed bow as someone has the crawl under the bow. I suggest you start with 50 - 70 lbs and adjust as you like. I run about 100 lbs in the nose of my single motored boats. Ski team's will use upwards of 850 lbs in some boats. Keep in mind that three 250 HO motors weigh 1600 lbs plus batteries & oil tanks to pull lots of skiers so weight is needed. I know more than one ski team driver that uses weight to balance the boat from side to side as he outweighs his passenger and likes the feel of a balanced boat. It is not an exact science and subject to the taste of the primary driver in most cases. Dyna-Ski boats has also put permanent weight under the floor of the boat below the gas tank when building a boat for customers that ask. 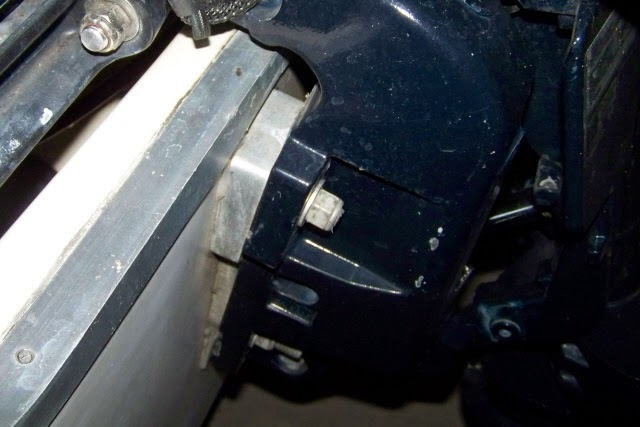 The easiest and cheapest thing to do is remove the pin that limits the travel of the motor down assuming the motor will not hit the hull of the boat. The motor won't hit the hull on Dyna-Ski Boats. Removing the pin allows the motor to be trimmed down more which helps keep the bow of the boat down. Top picture below is with the pin in and the lower is with the pin out and transom wedges. More on transom wedges later. The two methods of tuning above cost little to nothing. The next steps require money. 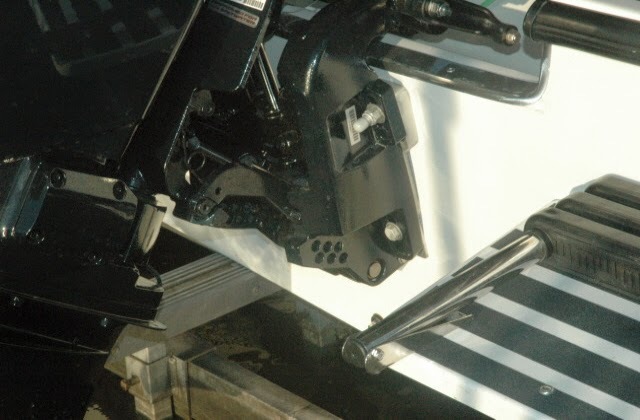 Dyna-Ski boats are designed to accelerate with the bow down and run level with very little motor trimming required. At higher speeds trimming the motor up a little reduces bow steer and makes the boat easier to drive. When you slow down and turn to pick up a skier with a Dyna-Ski Boat the bow comes up a little which helps keep everyone dry in the boat. Having the best prop on any boat for the engine and use makes a huge difference. I am assuming the outboard motor height is correct on the transom. Correct motor height is an article for another day perhaps? I like four blade props for Dyna-Ski Boats. The best one for the V-6 on a 17.6 is a 15" pitch four blade. The lower the pitch the more power that is available. The higher pitch props give more speed but less acceleration. A bow lifter prop on a water ski boat will make the boat hard to hold steady at slower speeds towing skiers. Most of the twin and triple motored boats we build for ski teams have 4 blade 15 pitch props. There are some older 3 blade props that work pretty well but most are not readily available new. The four blade 17 pitch is also a very good prop on a 200 or bigger engine on a 20' Open Bow. The 17 pitch gives a little more speed than a 15 pitch. It comes down to driver preference in many cases on a 20' Open Bow with a single motor. Next up on fine tuning is what we call transom wedges or shims. We now install them on every 17.6 Open Bow as them seem to have more affect on a 17.6 Open Bow and not much affect on a 20' Open Bow. There are several reasons we feel for this difference with weight and length being the main ones. In the picture below you can clearly see where the wedges go. They are not very expensive but it does require longer motor bolts (usually) and would best be done by an experienced outboard mechanic. An item that is often overlooked is shift and throttle cables. Older mechanical cables tend to wear and the friction or resistance to movement increase. This makes it harder to make small speed changes with mechanical controls. The mechanical controls also wear and get sloppy but not nearly as fast as the cables do. Of course with electronic controls there is no cable friction or wear allowing fine speed control adjustment very easily. 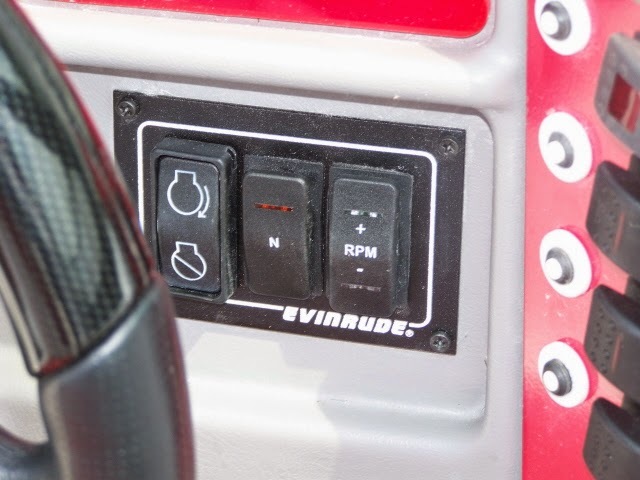 There are buttons on the dash (pictured below) to start the engine, put the boat in gear and bump the throttle up and down 1%. Sadly cruise control or "Perfect Pass" speed control is not offered yet. Electronic controls are pricey. They are available on some makes and models of engines. 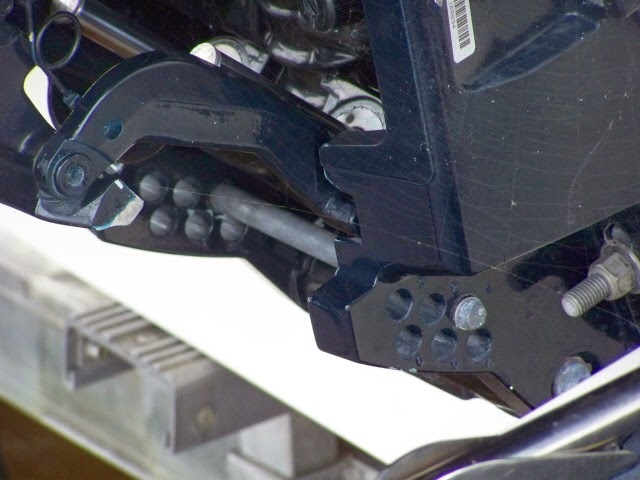 You now have several ways to fine tune your outboard water ski boat. If you or I come up with some more ideas I will add them to this article or write another one.